Perhaps this flow is better explained by a diagram. Click on Identity and under Facebbok Settings put you App ID and App Secret. However, if you try any of the other endpoints, for example, https://my_resource_auth_server.azure-mobile.net/api/auth, you should get a 401 unauthorized. 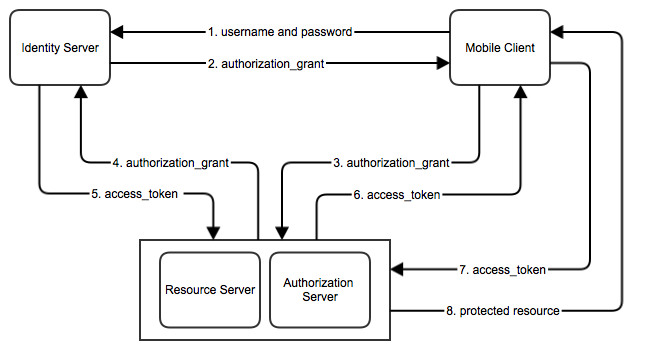 In this step, we are going to send the authorization_grant to our Resource/Authorization server to receive an access_token. Now, we are going to use the access_token that we received in the previous step to get protected resources. You should notice that we are passing the access_token as X-ZUMO-AUTH header. To get resource from https://my_resource_auth_server.azure-mobile.net/api/app, add a header called X-ZUMO-APPLICATION and pass your Application Key obtained from Azure website. Similarly, to access https://my_resource_auth_server.azure-mobile.net/api/admin pass your Mobile Service master key obtained from Azure website as X-ZUMO-MASTER header. Although, I used Titanium Mobile codes in this post as an example to make my point, but because of the lack of Titanium resources for Azure Mobile Services, I am getting a lot of questions on Titanium implementations. So, I have decided to quickly write a Titanium SDK for Windows Azure Mobile Services. You can check it out in github, it is very easy to use as it hides many technical details. The usage examples are also in the github. Let me know your feedback. Thanks for taking the time and put this together. It really is helpful for all us Titanium Developers. I have one question though. I have been trying to get “POST” to work and all I get is “HTTP error” as a response. I have done all you suggested here, of course I customized to make it work for my case, yet nothing has worked. Do you have any ideas on how to solve this very unhelpful error response I am getting (“HTTP error”) ? Thanks for your time. Highly appreciated. I am looking into it, please check back within few hours. POST is meant for adding, means you may need to send a complex object to the api. So, you have to wrap it in JSON as the request body. Also, make sure that the content type is JSON. PUT is meant for update, that means you need to pass an id (to specify which entry to update) and a complex object that will be the updated entry. In this case, ideally you want to pass the id as an url parameter and the complex object as a JSON wrapped request body. Hope that make sense, feel free to ask me if you need more clarification. Thanks for taking the time to help… really appreciate it. Going to try and will let you know. Again, you don’t know how grateful I am for helping. I went ahead and took a look at your code and all. I am not understanding something crucial in your examples. Authentication error has to do with permissions. Please paste what is in your PatientInformation.json file. Humm, I see the problem now. You have to use HTTP PATCH instead of PUT. And the url should end with /id, for example: https://my_resource_auth_server.azure-mobile.net/tables/todoitem/123 where 123 is the id. BTW, I still think Authentication error is due to permissions. I will soon update this blog post with these examples. Permission? Sorry, I don’t follow? Is there a way I can send you my script so you can take a look? I would post it on github, but there’s some sensitive info that I wouldn’t want to share with anyone else. Sorry for bugging you with this… I am just having lots of difficulties. I am not sure if it’s all on my side, or the webserver set up. Sure, send it to me at md.faisal.rahman@gmail.com .